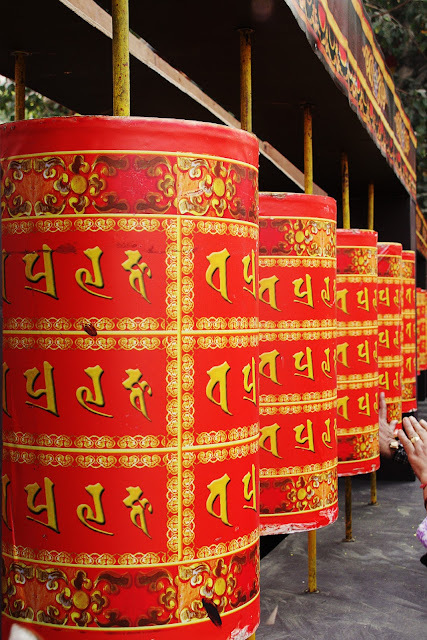 Traditionally, the mantra Om Mani Padme Hum (meaning “jewel in the lotus”) is written in Sanskrit on the outside of the wheel. Also sometimes depicted are Dakinis, Protectors and very often the 8 auspicious symbols Ashtamangala. According to the Tibetan Buddhist tradition based on the lineage texts regarding prayer wheels, spinning such a wheel will have much the same meritorious effect as orally reciting the prayers. In any case just the human interaction was beautiful to see.